Last month Penguin editor Sophie Missing and ex-Penguin now Kew Gardens-publicist Caroline Craig‘s first cookbook was published. The Little Book of Lunch is full of ideas from the raw (‘Rainbow Rescue: your five-a-day in a jar’) to the baked (salted caramel brownies in the ‘Bribing Colleagues with Sweet Treats’). These are recipes for office people with imaginations because even if you can’t usually manage more than one take-in a week you will love flipping through this gorgeous collection of inspirations and amusing asides on al desko etiquette and lunchbox-styling tips. What was it like being on the author-side of the project as current/former publishing-employees? Did you experience any (un)pleasant surprises? SM: It was actually really fun to see the other side of the process. And an eye-opener of course, because I was used to seeing things from the publisher’s perspective. I think I was terrified of annoying our publishers though! What’s been your favourite part(s) of the process? SM: It’s all been pretty exciting… doing the shoots was incredibly fun (though hard work) and a bit of a whirlwind. Seeing the proofs (and having what you’ve written suddenly look like ‘a real actual book’) is always exciting too. Mostly though, it’s been amazing to hear that people who aren’t our friends or our family like it, and enjoy the recipes. That’s the best. And a massive relief. CC: I loved writing it so much! Sitting at my laptop in the kitchen at the crack of dawn with a cuppa… It was also wonderful writing as a partnership: Sophie and I would bounce off each other and I think our writing was all the better for it. I loved the section on lunchboxes which made me feel inspired as well as deeply ashamed of my own scrappy Tupperware boxes. What are your favourite lunch receptacles and where did you find them? SM: Caroline is the queen of the attractive lunchbox. She inspired me to buy a rather chic (if I do say so myself) aluminium one from Objects of Desire. It could double as a handbag. Muji is also good and practical. CC: To be honest there are some mornings when I’m in such a rush I’ve been known to grab the first thing to hand to transport my lunch… a plastic bag… a tea towel. But yes, I do love my enamel tiffin tin too! You are very relaxed and non-dogmatic in your approach to recipe-following and encourage your readers to swap ingredients/improvise in case of missing herbs/spices/etc. How did you both get into cooking and what kind of cooks are you? Recipe-followers or rule-breakers)? SM: It depends on the recipe. With baking I generally follow a recipe pretty closely, although that being said, once you nail how to make something you can be a little bit more adventurous and gung-ho and try swapping ingredients or playing around with quantities. Otherwise though I’d say break the rules! Have some fun and experiment. CC: On a day to day basis, I tend to just look in the fridge and cook with what I have. I substitute things all the time! Life’s too short to panic about having the wrong herb. I became obsessed with cooking quite late: at uni I’d say when drunken increasingly elaborate dinner parties became the norm. What was it like working in collaboration and had you worked directly with each other before at Penguin? SM: It was really great working in collaboration, in fact I’m not sure if either of us would have done this had we not worked on it together. I think there’s a misconception that you have to ‘create something’ (whatever that means) by yourself, but working with someone else (especially a friend) is beneficial in so many ways. You spark off each other, you always have someone you trust’s opinion to ask (and someone who knows the project as well as you do) and, importantly, it makes the whole thing more fun. CC: At Penguin we started on the same day and sat back to back! We worked together all the time – Sophie in Editorial, me in publicity, PRing her books. We became lunch buddies (and real buddies!) very quickly, eating together every day, bringing lunch in for each other… the rest is history. If someone wanted to start making packed lunch after years of Pret-ting, which recipes from the book would you suggest starting with to ease oneself into it? SM: The avocado salad is really easy and we both make some sort of variation on it often, especially in summer. Sandwiches are always good too. Especially sandwiches using pitta instead of regular bread, as you can just stick a packet in the freezer (even if your freezer is the size of a remote control) and forget about it, cutting down on your pre-planning. Your book is entertainingly written as well as gorgeously-produced. Are you both natural food-stylists? And do you have any tips on improving one’s food presentation skills (I’m asking for a friend, honest)? SM: Thanks! Hmm. I think making food for photos is different for cooking in normal life as your main aim cooking for a photo shoot is to make the food look as delicious as possible, whereas when you’re cooking for people you are trying to make the food taste as delicious as possible. Buy some lovely vintage platters: everything looks nicer on a platter. CC: If you’re fastidious about presentation I would echo what Sophie says and suggest using serving dishes. Individual plates look more beautiful when they’re not overloaded with food, so when you’re dishing out, be relatively economical, and just leave the serving dish on the table. Helping yourself to seconds, thirds or even fourths is still more elegant than sitting with a pile of pasta the size of Puglia on your plate. Who are your foodie icons and inspirations and why? SM: My friend Ellen Parr, who is a chef and the best cook I know. She can take a packet of super noodles from the corner shop and make it into something that tastes and looks like it’s from Momofuku. CC: I worship at the altar of Delia Smith. The woman is a legend and pretty much every ‘new’ food trend is something she covered 10 – 20 years ago in her cookbooks. Her recipes work every time, tend to not be overly complicated and yet surprise and delight in equal measure. In the unlikely event of you not having a packed lunch one afternoon, where could you bear to buy lunch from instead? SM: I really love Eat’s macaroni cheese hot pot. It‘s my guilty pleasure when it’s grey and rainy and miserable. And when I worked in Notting Hill I used to treat myself to a sandwich from Mr Christian’s Deli once every week or so: chicken mayo with capers was my favourite, with a can of San Pellegrino. Living the high life. CC: If I’ve not brought my lunch in, it’s probably because I’m spectacularly hungover; so full fat Coca Cola, Walkers Salt and Vinegar crisps, and a pasty from Greggs are the ones for me. 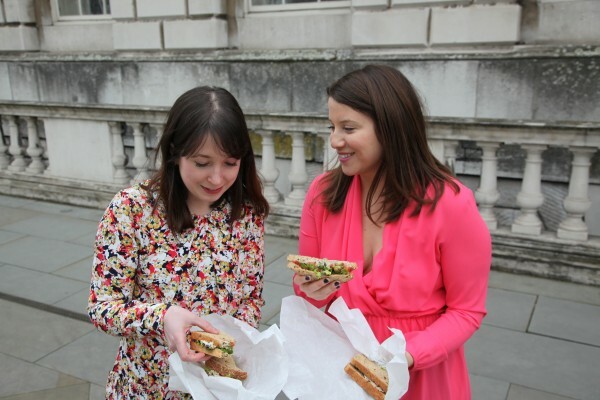 You met when you were both working at Penguin in London – did your love of packed lunches have anything to do with the quality of your office canteen? SM: Um. Actually probably not! The Penguin canteen’s pretty good (though the allure of eating a huge jacket potato EVERY DAY soon wore off). I think we’d both been making our lunch while working in past jobs, and as students, so we were in the habit. There’s also something so comforting about having made your lunch yourself. It’s something to look forward to. And it means that you can decide what you want to eat, rather than falling prey to the latest ‘soup of the day’/yet another enormous jacket potato. CC: The canteen was great, but it’s still someone else’s idea of what you want to eat. How long did making the book take from conception to publication? And how did you fit it in around your full-time jobs (apart from obviously recipe-testing and having handy tasters at work)? CC: Conception to publication was two years. It did sometimes feel like we had two full time jobs and was exhausting. I would get up at 5.30am and work until I had to leave for… work, then come home and test recipes, and do more writing. Not complaining though. Feel so lucky and loved every minute! And what are your next projects? CC: We have a couple of catering concepts we’re working up into something. We also have an idea for another book so we shall see! 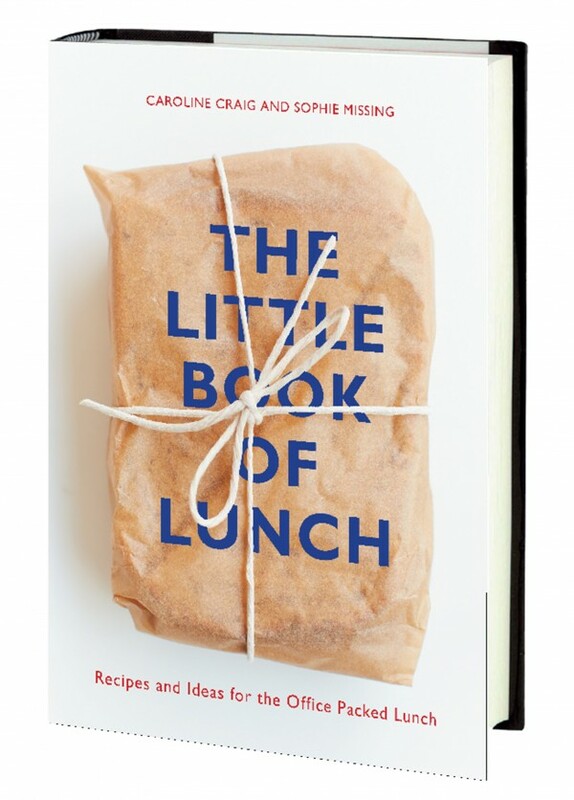 The Little Book of Lunch by Caroline Craig and Sophie Missing (Square Peg, £15) is out now. All mouth and no trousers: sexist book covers again, INTERVIEW: Helen Walsh & the opposite of sleep, INTERVIEW: I DREAM OF CAKE – baking & treats with friend of PAMFLET, Marianna Longmire, We Were There>> Virago Book Club with Linda Grant, Review: The BEST OF EVERYTHING! seriously?